Why does this matter? The introduction of eIDAS means electronic signatures, electronic seals, time stamps and other eTS forms now have the same legal status as their paper counterparts. What happens to my existing eSignatures? eSignatures created by a 'natural person' before 1st July 2016 will remain valid until expiry. Existing documents signed on behalf of ‘legal entities’ will also remain valid until expired but new documents being signed will have to follow the eSeal rules. From today, eSignatures can only be used by a ‘natural person’. This means that a legal person (such as someone signing on behalf of a company) will now need to switch to eSeals to validate documents. We have written about eSeals in one of our previous blogs. It might sound like a big change from the existing eSignature regulation but there is no need to worry. eIDAS will help make electronic identification and verification services more efficient and easier to use. SigningHub already complies with eIDAS for both local signing (keys held by the user) as well as remote sever-side signing, i.e. signing keys held in the cloud. 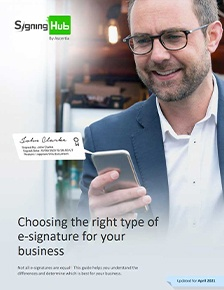 Moreover, SigningHub is capable of meeting the eIDAS requirements for both Advanced Electronic Signatures (AES) as well as the highest Qualified Electronic Signature (QES) levels. If you would like to discuss the changes further or find out what the best solution for your business within the context of eIDAS is, please don’t hesitate to get in touch.